Jack Yan is publisher of Lucire. Amanda Satterthwaite is a writer and photographer for Lucire. We had high hopes for the Wellington summer. The last few were glorious, but something had gone awry with the latest one. Since November, Wellington had had a major earthquake, flooding, fog, and a storm (all within 48 hours), and there seemed to be no respite. Into February, we counted only one period where there had been four consecutive sunny days. By then we were ready to go somewhere where we could be guaranteed some summer. Tahiti and her islands, only five hours away from Auckland, never has long periods of horrid weather. 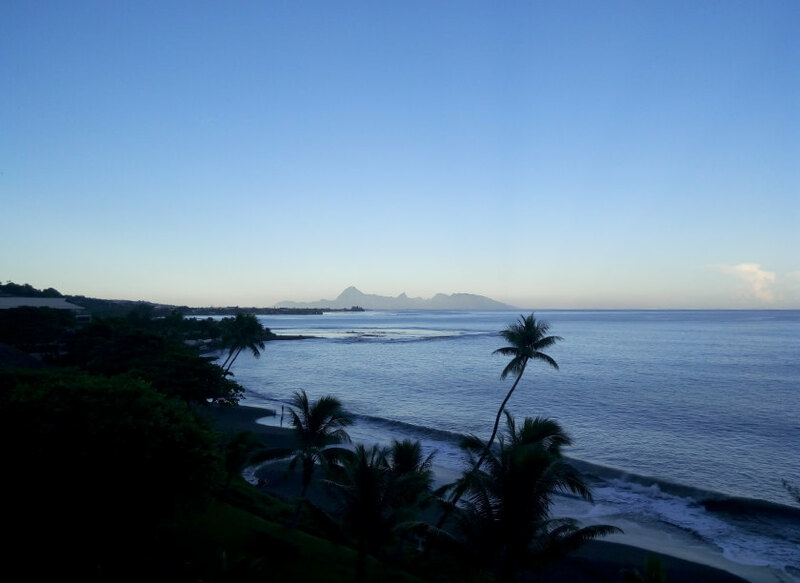 When we asked Céline Bacconet of Tahiti Tourisme when was the best time to head to the islands, she replied that there was never a bad time. That sounded like us. Lucire hadn’t been to Tahiti for many years—my own report for this magazine was in late 2005. And this time, it wouldn’t be somewhere that we were transiting through: we wanted to have a proper holiday and see what the islands now had to offer. 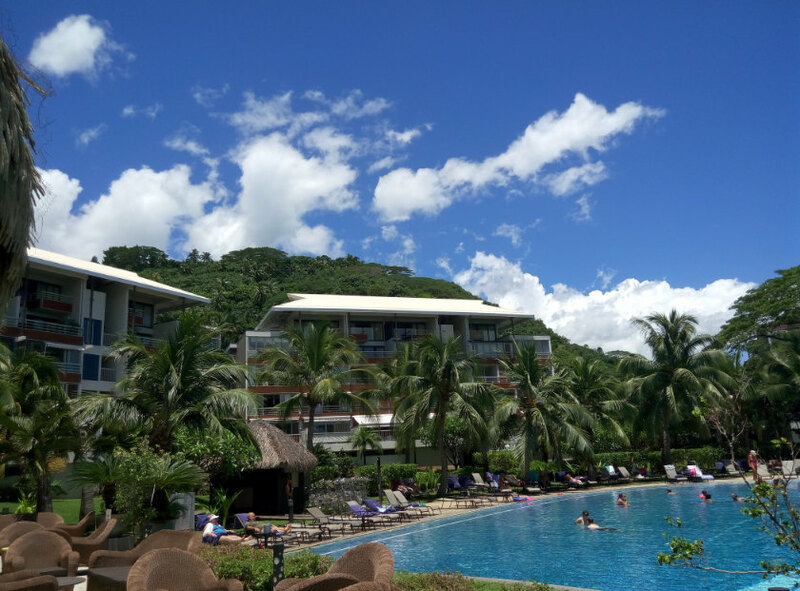 The itinerary was suitably different: we would first take in Papeete, the capital of Tahiti, for a night, before jetting to Bora Bora, known by many to be filled with romantic resorts. There was one more island on the agenda this time: Taha’a, which might be known to the initiés, but we had to do a bit of reading first. It’s known for its vanilla and pearls but information was relatively scarce. It would turn out, however, to be the real jewel on this trip. Getting to Tahiti was easy enough though we had to brace ourselves for a very long day travelling. Departing Wellington in the morning, we arrived at Auckland International Airport to check in at lunchtime. We saw Air Tahiti Nui flight TN102 at the gate, its bright, pearlescent paintwork complementing the blue skies in Auckland. 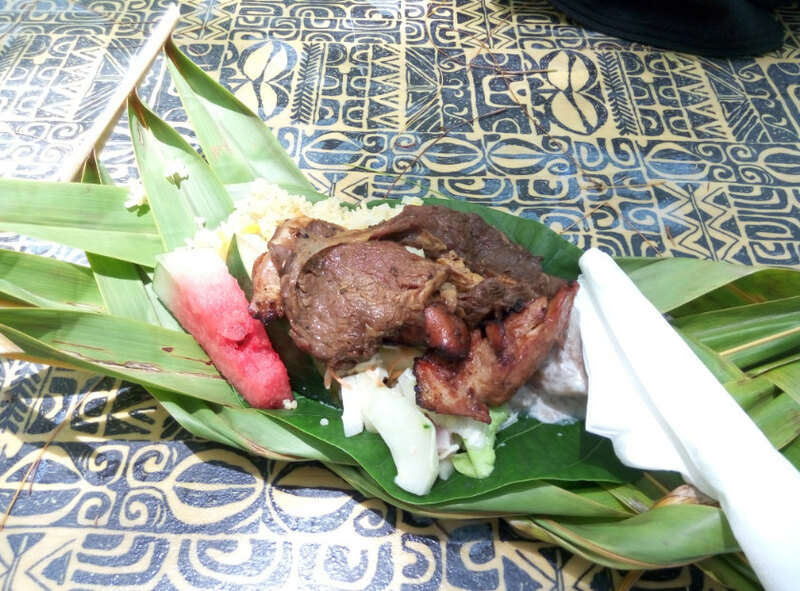 The comfort and meals were enough to keep us energized when we arrived in Papeete at Tahiti Fa’a’ā, the islands’ principal airport. 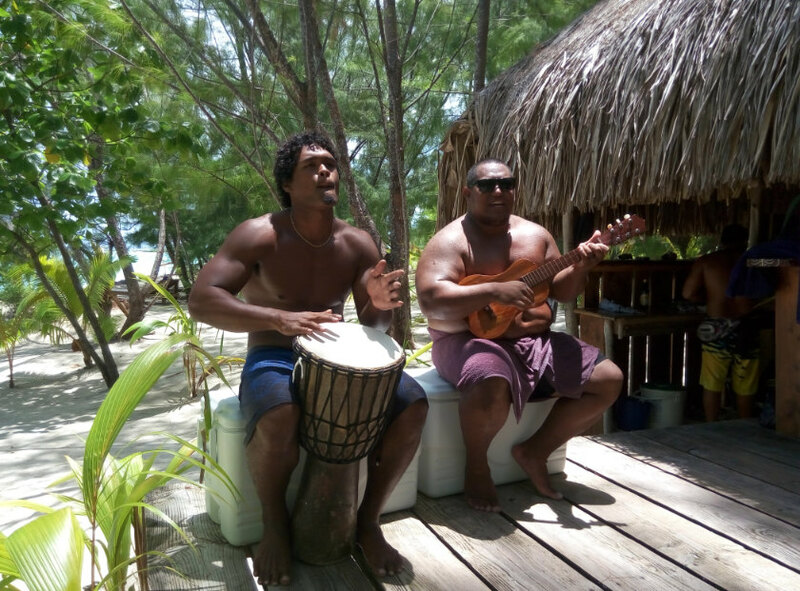 The airport was now undergoing renovations to cope with the increase in tourist numbers, but some things remained the same: musicians playing traditional music at the gate, signalling that even though this was technically part of France, Pasifika influences every part of the culture. In the last 12 years, Tahiti’s native culture had permeated into society far more. When we got out of the airport to meet the minibus driver from South Pacific Transport taking us to the Tahiti Pearl Beach Resort, I noticed the street scene was somehow different. There was one police van, decked out in the same livery as the equivalent in l’Héxagone, but the feeling was familiar to both Amanda and me as people from another Pacific island. I didn’t experience a shock that I was in a part of France, and not all of that could be put down to the fact I had been here a dozen years before. 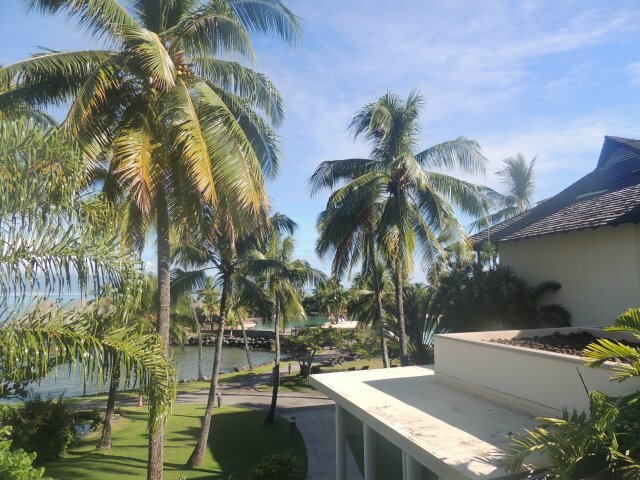 The Tahiti Pearl Beach Resort was a wonderful first stop and we were delighted at our fifth-floor room overlooking the Pacific. 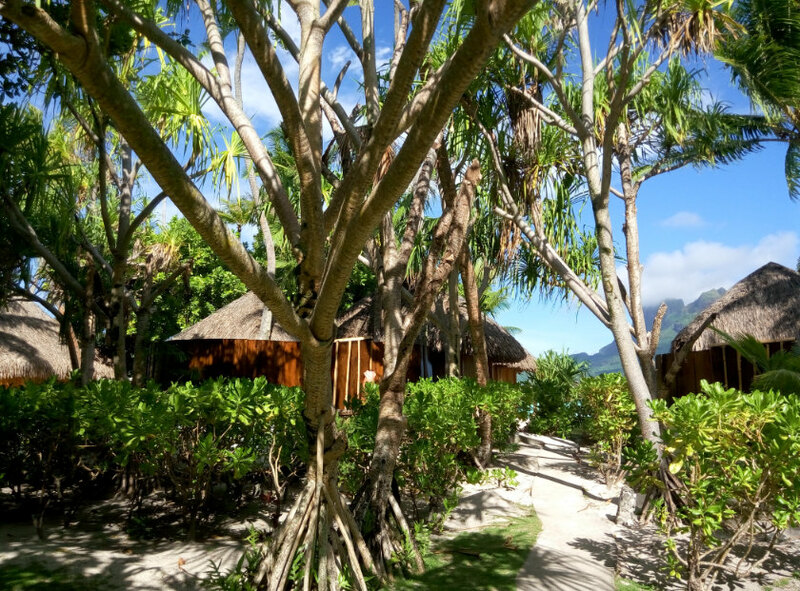 The waves lapped gently at the shore and made a soothing sound to rest to, while our bed had the Tahitian greeting of ‘Ia orana’ spelled out in straw as a very welcome greeting. As a split-level room with bathrooms on both floors, it was particularly comfortable and homely: what a pity we would only be here one night, with Bora Bora on the agenda for the afternoon. We rested but were excited to see the sunlight the next day, opening the curtains to a tropical view, with palm trees and peaks on an island in the distance. The resort’s architecture blended well with its surroundings, and daylight confirmed what we sensed the night before: that this was a very nicely appointed and comfortable suite. Knowing we had to travel again, we settled down to a beachside buffet breakfast, with live traditional music playing, and a relaxing view out to the ocean. 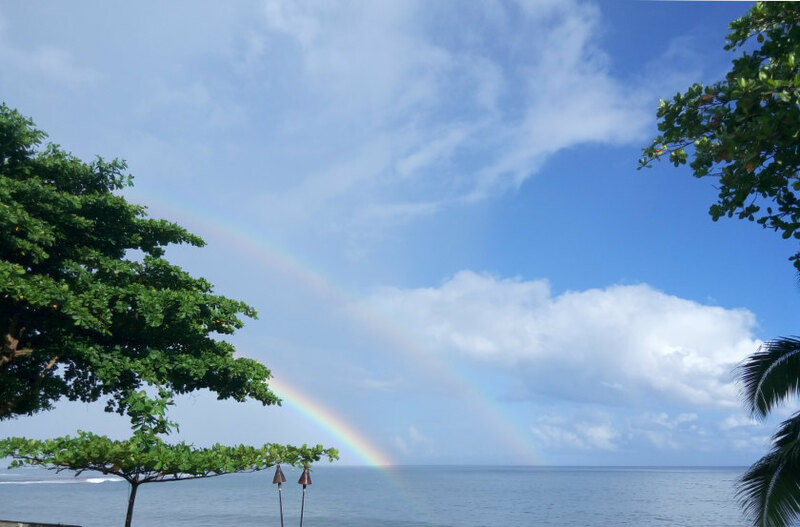 The heavens opened with warm, tropical rain for all of 10 minutes; once the clouds moved on, we were treated to a double rainbow. In no time at all the nearby swimming pool was populated again, as though the weather was never interrupted. South Pacific Transport came to take us to the airport and we had more of a chance to appreciate downtown Papeete, which we had to drive through to get back to F’a’a’ā. Our suspicions were right: everything looked more Pacific-island than French; outdoor advertising championed the islands’ diversity and featured native Tahitian faces; and, perhaps tellingly, the grip the French motor industry had over Papeete had diminished. SUVs and small Hyundais and Volkswagens were the order of the day; and white paint was de rigueur, given the hotter temperatures. F’a’a’ā itself felt different in the daytime; it was less manic at this hour and we found ourselves grabbing a very basic meal and drinks at the airport. 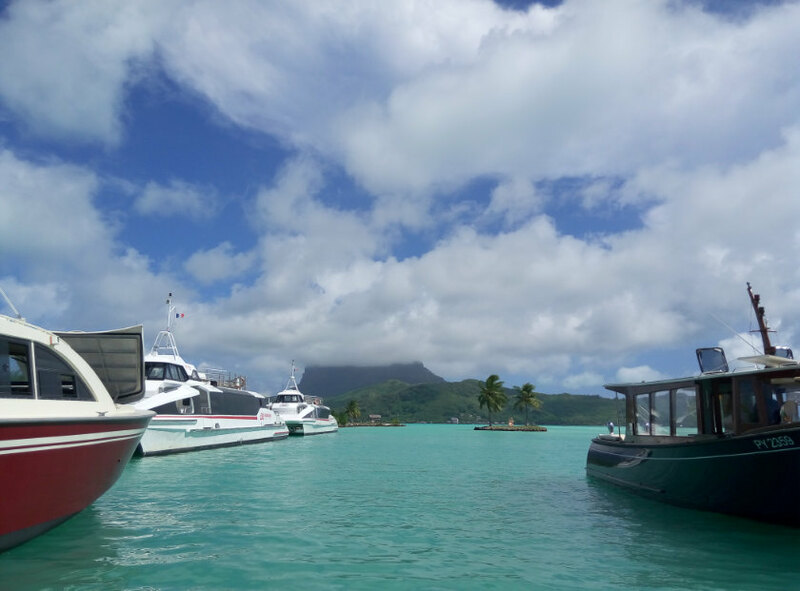 Air Tahiti, the domestic airline, has open seating rather than assigned seats, contributing to a sense of “island time”; it was a short walk across the Tarmac to board the ATR plane and fly to Bora Bora. Bora Bora Pearl Beach Resort & Spa, above from top: Heading to the resort. Our fare—we chose to be on land rather than over water. Mt Otemanu in the late afternoon. A view from the spa. Mt Otemanu in the early morning, as seen from the restaurant at breakfast. The scenery is breathtaking, which explains why the more familiar fliers had taken window seats, but we managed to glance out at the turquoise and blue Pacific below. Upon landing at the airport, built by Americans during World War II on the islet of Motu Mute (motu is Tahitian for island) so they could land their aircraft, staff from the Bora Bora Pearl Beach Resort & Spa, our next destination, were on hand to greet us, and take us by boat to Bora Bora itself. 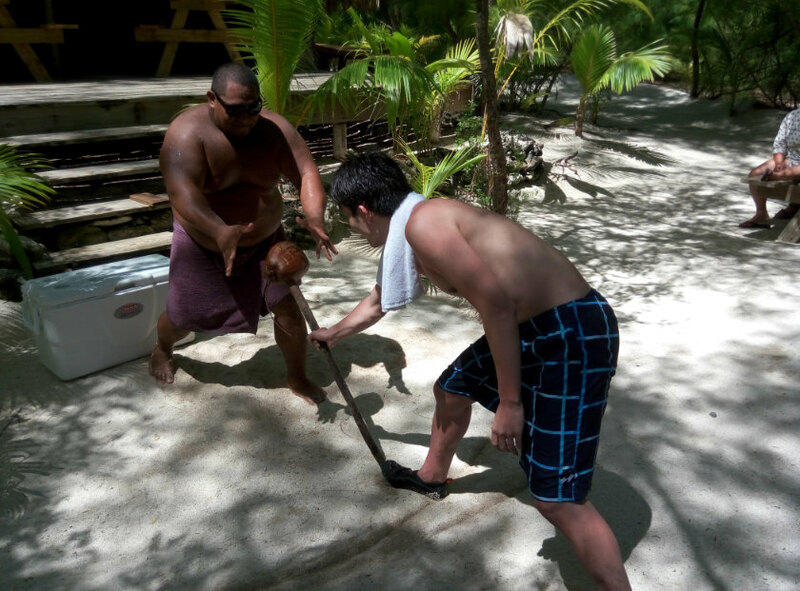 Yonni, working at the resort, was a young, multilingual man who could even speak Mandarin (alongside Tahitian, French and English), and he proved a friendly and welcoming face to Bora Bora. 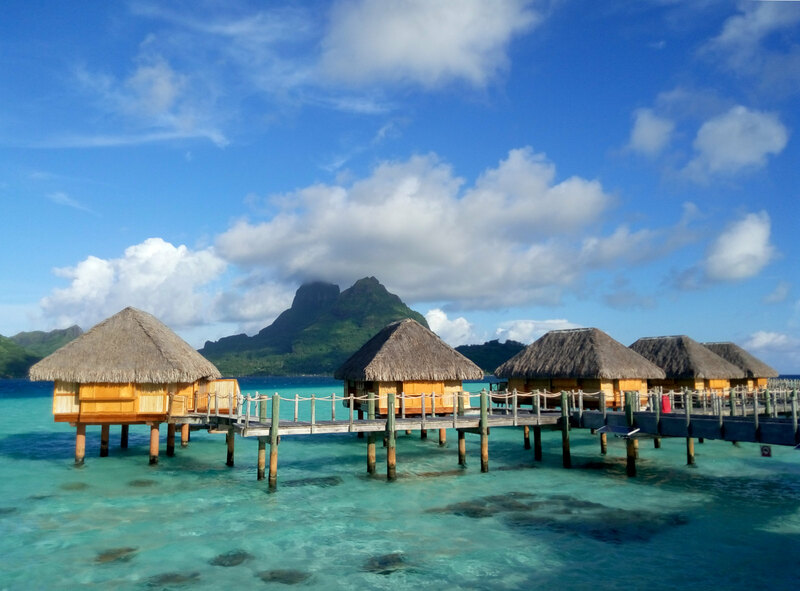 A member of the Leading Hotels of the World, the Bora Bora Pearl Beach Resort & Spa was a mere 15-minute ride away. We were greeted by Giulia Manzoni di Chiosca, the deputy manager, who originally found herself at the resort as the wedding coordinator and guest relations’ manager. After we freshened up, we were shown our suite, a thatched bungalow (or fare, a word that has its equivalent in the Māori whare; the wh spellings are not used in written Tahitian) with an outdoor Jacuzzi and bathroom, a bedroom and a beachside room with a lounge bed. A window opened up to reveal the sand and ocean beyond, as well as Mt Otemanu, the island’s highest point (727 m) rising sharply out from the Pacific. We preferred the bungalows on terra firma to the over-water suites, but each have their appeal. Wifi is in public areas only. Grabbing a lunch at the poolside Teavanui Bar, we noted the New Zealand sirloin steak (CFP3,000), but we didn’t come all this way to sample meat from back home. More intriguing was the Māori pizza (tomato, mozzarella, pineapple, ham and onion), though we wound up with the mahi mahi burger with fries (for Jack), while the kitchen was more than happy to prepare an off-the-menu delicious vegetable dish with rice (for Amanda). Banana and mango juices accompanied our lunches. Native birds were happy to walk about on the wooden floor, not disturbing the guests. Teavanui, we noticed, had particularly high-quality food, more so than we had expected, given that the resort considers it a more casual lunching area. The reality is that it is the equal, if not the superior, of its flagship restaurant, the Tevairoa, to which we would venture later. Nearby, vanilla plants grew from a crop first planted in 2010, with its first blooming in 2012. By 2017 the crop was doing quite well. After lunch, Manzoni gave us a tour of the property, noting it had 80 bungalows (50 are over water; there are also 20 Garden Pool suites and 10 Beach Jacuzzi ones) and its own coral garden, with 60 varieties of fish. 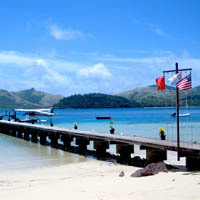 The resort chose to promote the ecology of the area, with the first coral colonies planted in 2001. Using a patented Biorock process, a very light current that is completely safe to marine life and to swimmers is passed through a structure that speeds up coral growth. 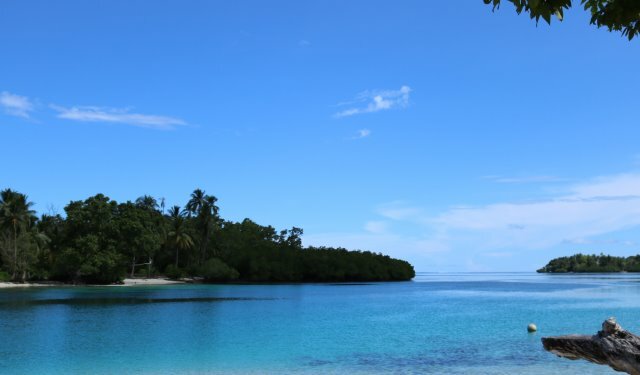 The current is solar-powered—solar panels can be seen alongside the ponton—and the Biorock method has successfully restored coral reefs even in more difficult areas. There was no such difficulty here, with the clear waters of the Pacific particularly sheltered in Bora Bora thanks to a natural reef further out. Those who wanted to explore the coral could get their hands on diving equipment stored at the end of the ponton, though the water at the resort was quite shallow. She also explained that the resort is Tahitian-, rather than multinational-owned, and that the owners believed strongly in preserving its Tahitian heritage, while investing in the people and in the environment. Manzoni didn’t use the word eco-tourism, which has become hackneyed in some quarters; it was apparent the resort preferred to show in deed rather than in bragging. The over-water fare were pleasant and bright, as we checked out some of the other suites, and we could understand why most visitors would prefer having the waves beneath them. A floor-mounted glass box with a sliding door showed the turquoise water below, as did the windows in the bathroom that looked down; for safety reasons, the door could only slide so far, and not allow anyone to jump through. In line with its principles, shells adorned coat hangers or became soap-holders, hand-carved wood with native patterns served as trim on the walls. 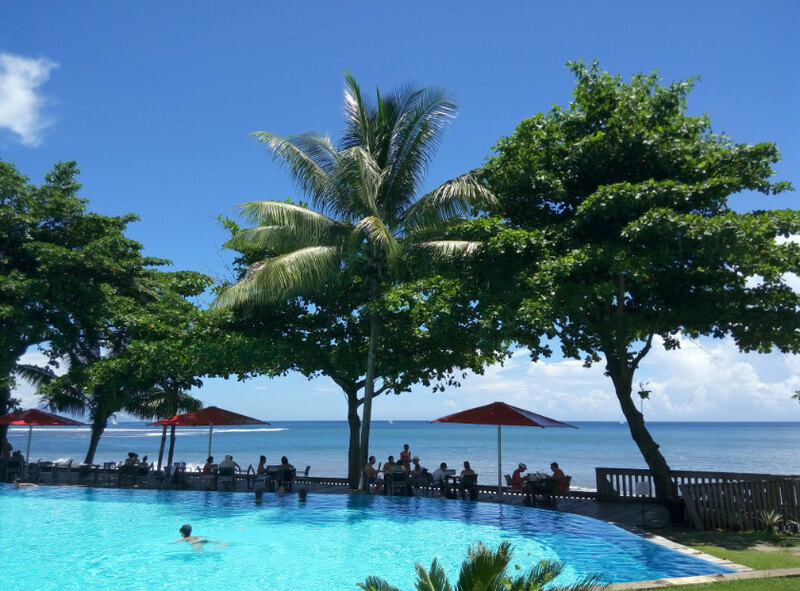 Others who might not want to venture out diving at the coral reef can be entertained with a billiard table or relax at an upstairs bar in the main complex; there are also tennis courts and volleyball on land, as well as a well equipped and modern fitness centre. But Manzoni was particularly proud of the Tāvai spa. Set in a serene part of the property, with flowers and a pond nearby, we immediately felt relaxed on entering. There was native art on the walls but this was offset by the minimalist and modernist zen design. 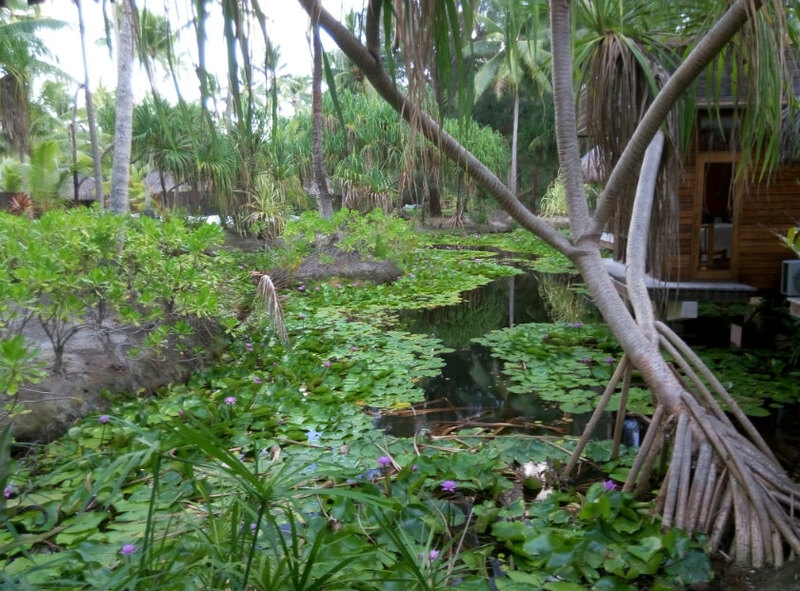 We kept gazing out at the views from each treatment room, with lush vegetation and lily pads surrounding us; on this alone we felt relaxed. Stéphane, who managed the spa, showed us massage rooms and a Vichy shower, and there’s even an avae taurumi, where the therapist uses the balls of her feet and heels to work out tension. Dinner beckoned at the Tevairoa, and the staff were happy to accommodate our request for gluten-free bread, and the wine list was impressive, although for sheer fun, Teavanui had the edge. Waking up to Mt Otemanu was a treat, a reminder that you were in a slice of paradise. And it was warm, with the sun beating down pleasantly overhead. Tevairoa was the breakfast venue, too, with a different vibe in the morning, and we were able to indulge in continental meats and vegetables, and gluten-free bread, before we embarked on our second day’s adventures here. Ray of the Bora Bora Lagoon Service met us at the pier for a full day on the lagoon, complete with swimming and lunch on another motu. 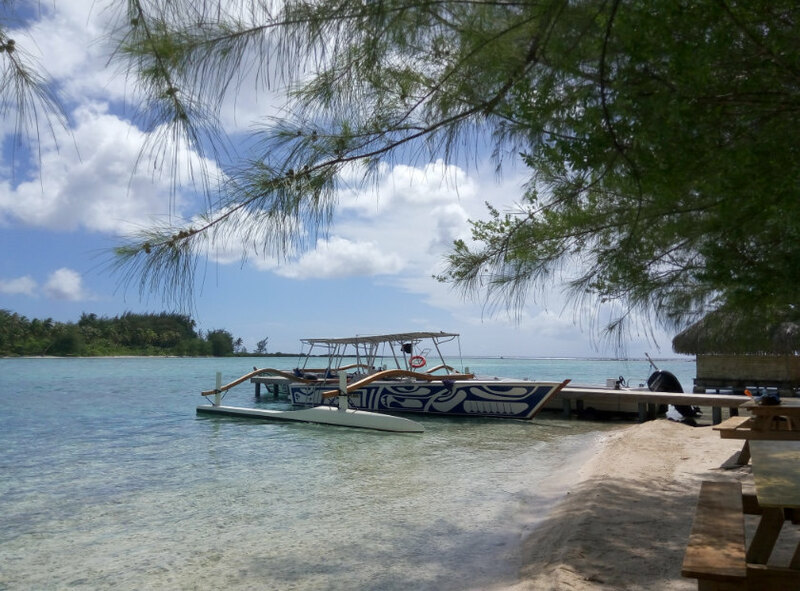 He was very proud of his 12-seater boat, which appeared freshly painted in white with a black, Tahitian art pattern, and we headed to several other resorts to pick up other couples joining us for the excursion. Once we were all together, and we were indulging in fruit juices, sodas and, for those who wanted it, beer from his icebox, the music began: out came his ukelele and we were treated to traditional tunes as we headed to different points around the island. 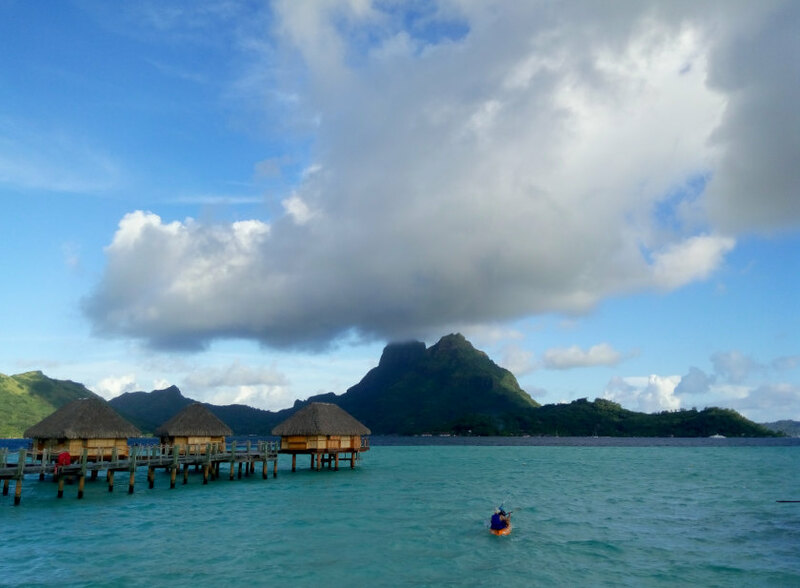 Mt Otemanu, of course, was pointed out as the highest point in Bora Bora; we spotted Vaitape in the distance, the island’s main population centre where supplies came in, and we spotted fish in the clear waters of the lagoon. 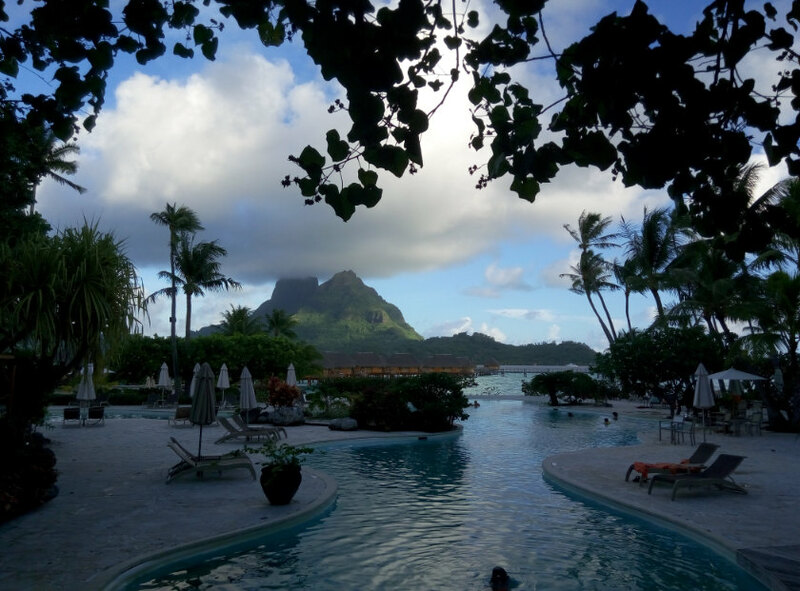 The Hôtel Bora-Bora, which Lucire reported on in 2005, was a ruin: we passed by and Ray explained that it could not escape storm damage, even if Bora Bora typically escaped the treacherous weather. There was not much left beyond a few beachside fare. 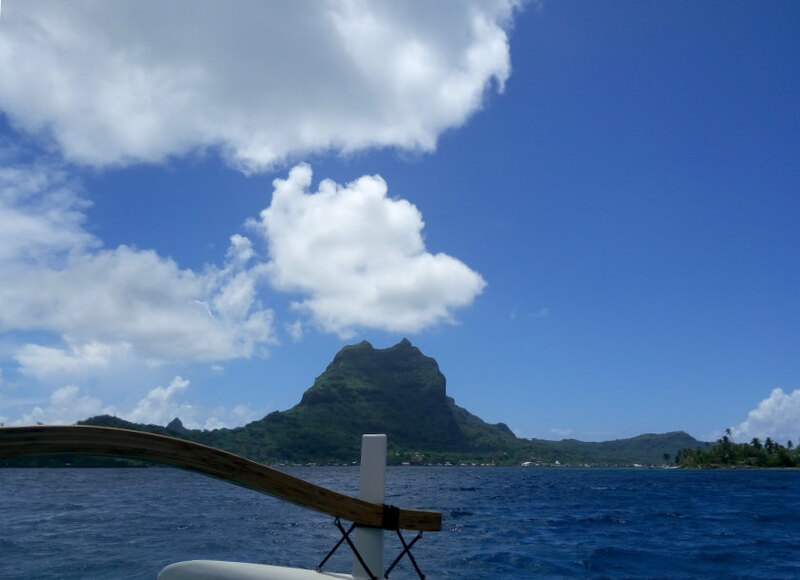 A cruise ship was anchored outside the coral reef—the larger craft were not allowed in—and we were treated to more views of the impressive Mt Otemanu, before Ray stopped to tell us that we were about to dive in with sharks. Touring the lagoon Viewing Mt Otemanu at another angle: you never tire of it. 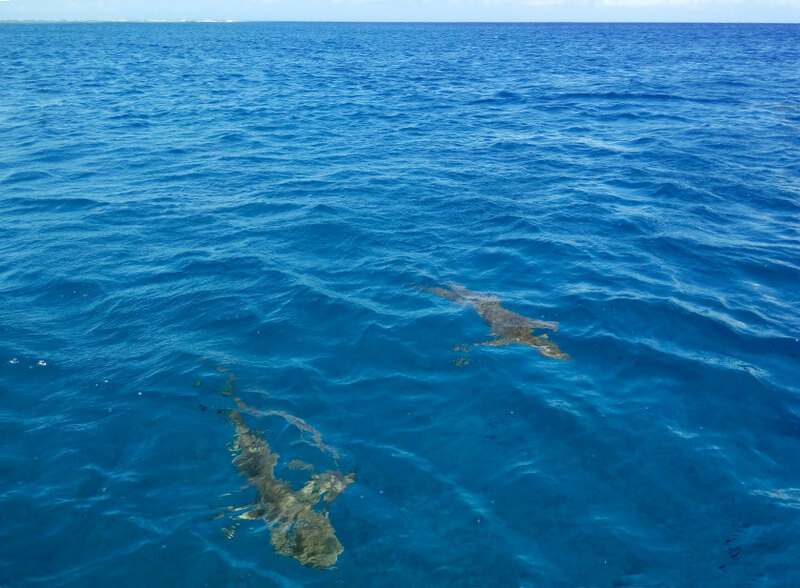 Reef sharks: we get up close to them. Ray’s tour boat. Ray and his fanau entertain us on their motu. A home-cooked meal on the tour. Ray demonstrates how to open coconuts, the traditional way.